One of the biggest things that can make a difference to how you enjoy your day out on your boat can be how your boat trailer is set-up. Why is this you ask? As simple as it sounds, when your boat trailer is set-up correctly it will tow better, your trailer will sit behind your car better, it won’t swerve all over the road and naturally it will be a lot easier to launch and retrieve your boat on and off your trailer. How to set up your Boat Trailer covers things like boat roller and trailer skid set-up and positioning, when to use rollers and when to use skids. Learn how to position the boat on the trailer correctly and you will soon be spending more time in your boat than struggling with your boat trailer. First things first. Let’s start with the smaller trailers and work our way up to the medium to larger sized boat trailers. 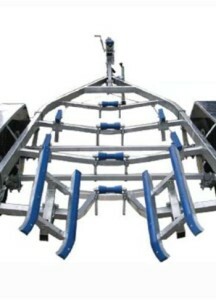 Most 12 to14ft (3.7-4.3m) boat trailers come with fixed or welded on suspension, you won’t be able to move or adjust the position of the suspension. However, boats that fit on these smaller types of trailers are generally at the smaller and lighter end of the trailer market so don’t have a lot of draw bar weight so adjustment is generally not needed. Once you get a boat trailer larger than 4.5m in size you may need to be able to adjust the suspension forward or backward which will allow you to attain the correct draw bar weight to make sure the trailer tows correctly. We will get to this topic shortly. If you have too little draw bar weight the trailer won’t sit behind you when you are towing, instead it will tend to swerve or sway from side to side all over the road. It is possible to get into a situation where your trailer appears to sit behind you correctly, however when you go to overtake someone and pull back in front of them you’ll find the trailer wants to sway. It’s not so bad if the trailer sways from the outset because you’ll notice the trailer swaying behind you and it will allow you to adjust your driving accordingly. The alternative situation is a more dangerous one because you may not notice the problem until it’s too late. If you aren’t experienced driving with a boat trailer and don’t know how to handle the problem of swaying it’s easy to roll the whole car and trailer over. Possibly the worst thing you can do is put your foot down on the brake. A better idea is to speed up slightly to get your trailer back into a following situation and then slowly let the whole trailer slow down to a manageable speed. The easiest way you can fix the swaying issue is by adjusting the suspension position further back on the trailer chassis. This will allow for an increase in the draw bar weight and will make the trailer follow the tow of the vehicle. Trial and error is the easiest way to determine how far you need to move it. In most cases it won’t be much, just make sure you place a marker where you started so you know how far you have moved the suspension. Ultimately, you will want the draw bar weight to be substantial enough to get the trailer to follow your car at all times. If your trailer is too light the wheels will follow the road surface rather then your car and let the trailer will go where it wants. conversely if it is too heavy and then you’re in danger of overloading your trailer tongue on the car, it can make the front end of your vehicle too light. This can affect the steering of the car and cause damage to the suspension of the towing vehicle. As a rule of thumb the standard was once that 10% of the weight of the trailer and boat was what you needed as draw bar weight. While this isn’t a bad measure for some boat sizes, it doesn’t work when the units are too heavy or too light. Imagine the following situation. A boat that weighs 200kg – that would mean there is 20kg of draw bar weight, which in reality would tow pretty badly. Now take something that weighs 5000kg; you would have 500kg of down force on your trailer tongue. Not a lot of people have tow bars that are rated for this weight. Most tow bars have a maximum down force rating of 350kg. I haven’t seen too many trailers available with that sort of draw bar weight. The bottom line is that you should be able to tow your trailer/boat or caravan down the road at a minimum of 90km/h without the trailer swaying –and it should not sway when you overtake someone, as long as you stay under the legal speed limit.